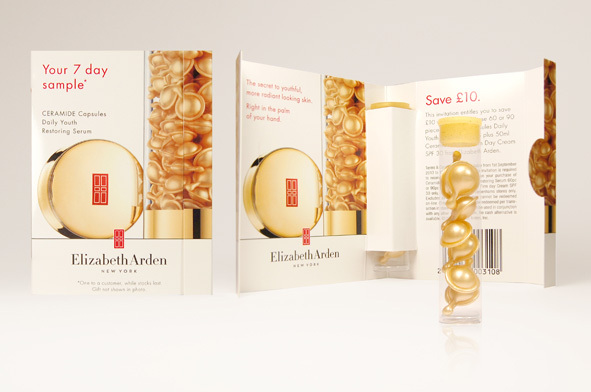 Splashdown design the packaging for the latest sampling campaign from Elizabeth Arden. Containing 7 Ceramide Daily Youth Restoring capsules in a gold capped test tube, the premium offering was neatly held in a giveaway wallet featuring a re-deemable tear-off voucher. Gloss laminated both sides, this luxury sample offers customers the perfect opportunity to try a perfect dose of Ceramide Serum.